With rich experience of engineering products and deep knowledge of manufacturing processes we understand the significant uses of drawings. For the precise production perfect drawings play the vital roll. About all engineering sectors are making use of CAD drawings. Sorting of the drawing is also as important as to keep them safely. So to add value for the storage of drawings, we have designed and developed the drawing cabinet. It is available with partition option for sorting A2, A3, AND A4 papers. It is also contains the whiteboard and pin board. 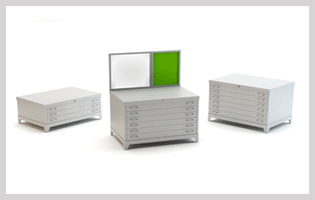 We provide 3 drawers to 6 drawers which are stackable one on one. It is also contain accessories to make convenient searching of drawings. Available in different sizes like A1 and A0 for graphic prints and posters.